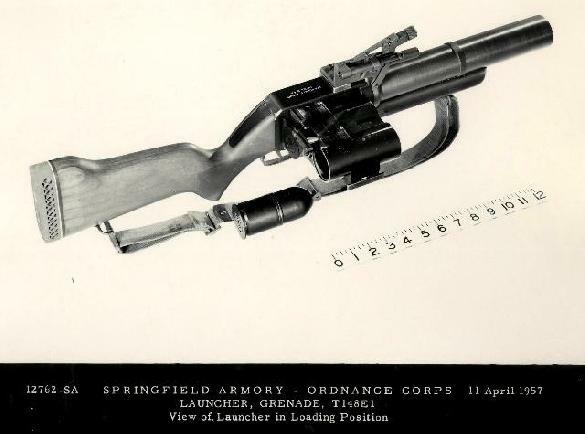 Manufactured by Springfield Armory, Springfield, Ma. - The T148E1 Launcher is a 3-round, magazine-fed, percussion-fired, semiautomatic, shoulder type weapon that is capable of launching an antipersonnel fragmentation type projectile. Weapon has sights similar to M79 but graduated to 315 yards. Small metal plate missing from bottom of forearm otherwise in excellent condition. Markings: Receiver: SPRINGFIELD ARMORY/LAUNCHER, T148E1/U.S./101.